As you might guess, I did a lot of concept design work for The Big Snow Job. I’ll be posting images from my sketchbook in batches, breaking up the batches with other Bonus Content every now and then. This first group of sketches goes back to the first issue of the story arc. Here we have the Preegans, the double-crossing bug aliens that first show up in The Big Snow Job #1, Page 4. I wanted them to be small and insectoid but had a bit of trouble settling on something that didn’t look like just another typical alien bug. 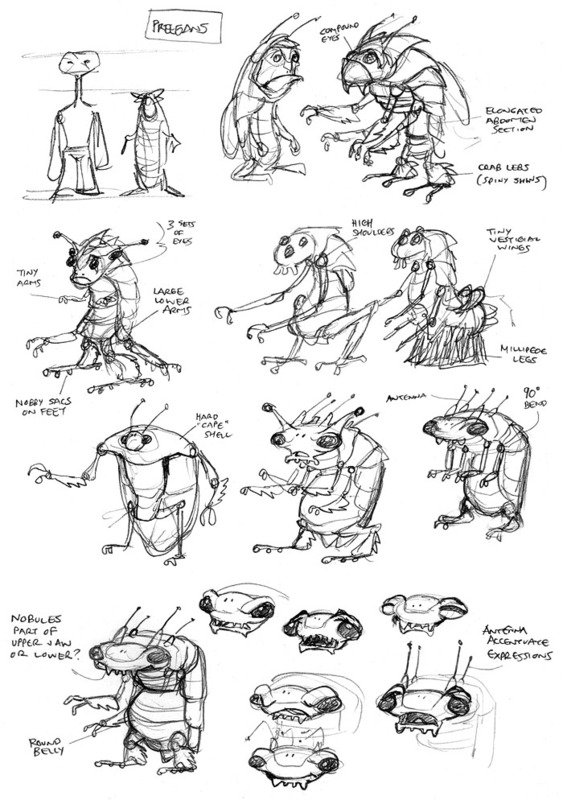 Once I sketched the roach/beetle-looking guy with the 90-degree bend between the torso and abdomen, that was it. I liked that the hunched-over back made them look a bit sneaky, while the round bellies kept them looking comical. I figured I’d do a few quick facial expression tests too since I knew they’d have to look pathetic when pleading their case to Roka, and I wanted to make sure I’d be able to capture that in the art. The pleading on page 8 worked out very well. Not just with expressions but also the body language/arm gestures. I’d like to see the Preegans pop up from time to time. They can be the Jawas of the Runners Universe: annoying for the main characters to deal with, but funny/hilarious for the readers. I totally agree on the Preegans popping up every now and then. I really like them as they’re a lot of fun to both write and draw. That’s one good thing about creating a bunch of aliens for a sci-fi series. After that initial concepting is done in the early stages, I can revisit certain alien races whenever I think they’d suit the story. Or whenever I’m too lazy to design new ones!